Project Recap – what the HLF are funding? The HLF released the funds in early March 2014 with a completion date by the end of December 2016. This gives us extra time. The application requested the award to commence in August 2014 with completion by the end September 2016. We are still aiming for an official launch in September with preparatory activities before that date. For example, it gives us time to publicise the project within and beyond the community in advance of the proposed schedule of activities, It also offers opportunities to set up some advance training workshops for volunteers in requested areas of interest, eg., research in family, regimental regimental history, use of online archives, oral history interviews, etc. FYI – Attached below is a summary of the proposed activities and events. It provides a summary timetable of what is currently planned. There are also opportunities to widen the range of community activities, for example: developing WW1 themed events for possible inclusion at the 2016 Bottesford Gala; collaborating with the football club to reenact the Bottesford Ruston and Hornsby Womens’ Football Match played against the Grantham Mens’ Team in late 1918 (result 4 all!) with the men playing one hand tied behind their backs! ; developing WW1 themed activities with the Garden Association given the importance of domestic food production as the conflict progressed. More detailed research into the Grantham Journal Archive will no doubt provide other possible ideas. 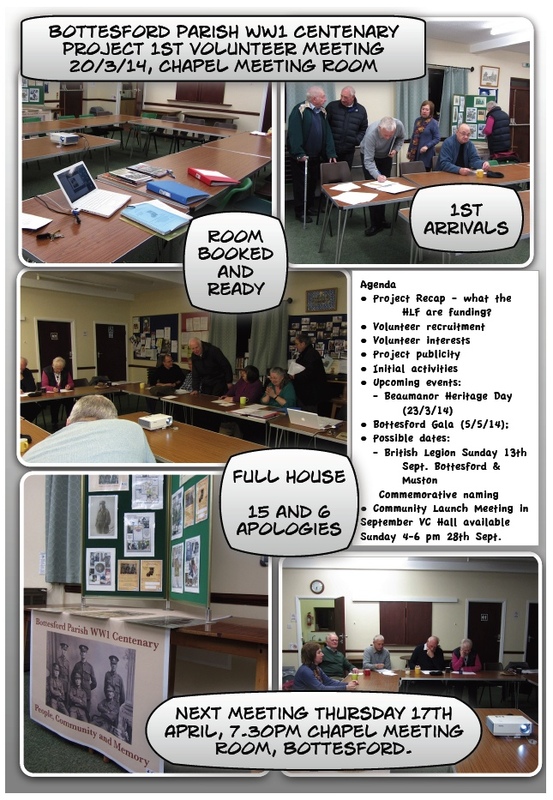 – Working with volunteers, research the First World War history of the Parish of Bottesford through various resources. – Ensure volunteers receive appropriate training where necessary. – Engage a good range of people and organisations to ensure learning is shared as wide as possible. – Develop and deliver a range of activities including events, exhibitions and heritage trails that will enable people to learn about the conflict and its impact. – Restore, conserve and re-dedicate the Roll of Honour in Bottesford Chapel. – Create an online archive of material including oral histories gathered from the community. These are the ‘Approved Purposes’ as set out in the HLF’s approval letter. They provide the criteria against which the success of the project will be assessed. Given the range volunteer skills, interests and experience already identified within the group we are very well placed to deliver the project in full and within time. The Village Voice has kindly volunteered the use their distribution network. This provides us with an important resource for promoting awareness of the project within the 1800 households of the Parish. Of particular significance is the capacity to reach those who do not have access to the internet. The scope of the project will be described in the front page article in next issue of the Village Voice. This article explains that the focus of the project is on both those who served from the four village of today’s Parish and those who served from families who live in the Parish now. (For further information please see the attached article below). The Village Voice has also provided the means for distributing twice yearly Project Bulletin and two Annual WW1 Belvoir High School News Letters. Thank you for completing the survey of volunteer interests and experience distributed at the meeting. The responses are really helpful in revealing the range of skills and interests we have within the group. Thank you also for providing an estimate of time you might be able to contribute as a project volunteer. Most people indicated 8 hours +. This is very helpful in gauging the overall capacity of the group in relation to the proposed activities. Thank you to those who used the online coordination of meetings service – ‘Doodle’. This seemed to work well. We would not aim to make that the sole means of informing people about meetings. It does however provide a quick way of obtaining feedback about availability that is visible to all those who are on the list. We plan to schedule monthly meetings. Thursdays seem to work well in the short term. Proposed dates for the next three months: 17th April; 22nd May; 19th June. The aim would be to focus on some aspect of volunteer training at each meeting in addition to sharing progress information and establishing future actions. (1) Identify people and family who have stories to tell about their relatives and family involvement in WW1, for example who served, war work by men and women and memorabilia? (2) Use the list of ‘those who served’ from Bottesford to enable volunteers to identify relatives within the village. A number of volunteers have already conducted research into their own family member’s service. Versions of these service biographies and any WW1 family experiences would make excellent starting points for developing project material. It would not need to be all the material people have. A short introduction with some photographs would be an ideal addition to the website. If you have not already tried using the website we can set up a brief introduction on editing and submission. Part of the remit of the project is to provide evidence to the HLF that volunteers have engaged in project activities. Please do log any time you spend on the project eg., time spent thinking about it, talking to others, conducting research, engaged in activities. Mike Meech has kindly volunteered to compile and keep a record of all volunteer time and activities. A useful way of logging activity would be to photograph of what you are doing and provide a brief note about it and time spent . Such diaries of volunteer activity could be added to our project archive. Action: Any volunteers for the secretary role? To handle documents and to make them accessible to volunteers we could use the facility of ‘Google Drive’. Setting this up and making it accessible to all is something that needs further investigation. (1) Promotional Stall Stall @ Wartime Leicestershire Beaumanor Hall Heritage Day (23/3/14). – reminded us that we need to get in early to book the services of the Khaki Chums for the Primary School Activity Day in the Autumn Term of 2015.